29th September 1885 was the day when Blackpool first ran its famous trams. There have been a number of celebrations for the trams marking the years as they pass, 2010 being no exception. You may have seen our programme No. 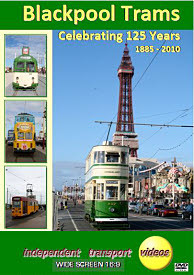 125 – ‘The Centenary of Blackpool Trams 1885 -1985’ that features the events at the 100th birthday celebrations in 1985 in the form of 8mm cine film from the camera of Malcolm King. In 2010 the independent transport videos cameras visited Blackpool to film the 125th celebrations and the everyday operations of these venerable trams, of which most will be replaced in 2012 by a new fleet of modern low floor trams. Our filming takes place in the four days leading up to the big day and covers a number of locations. We start our filming at the Rigby Road Depot Open Day on Sunday 26th September 2010 where a number of trams were on display for the public to inspect. General filming starts on the North Promenade and moves onto the centre of tram operations, the North Pier. From here we film along the Central Promenade before jumping on board Millennium car 724 to the Pleasure Beach. Returning to the Central Promenade we observe the action of the famous Blackpool fleet as well as historic trams from other systems, such as Sheffield, Bolton and Stockport. Our cameras then move to Cleveleys and from here we travel on Balloon car 719 to Fleetwood. We make a change of vehicle and board Balloon car 711 for the return journey to ‘The Manchester’ for more filming along the Central Promenade. The big day dawns – Wednesday 29th September 2010, unfortunately with heavy rain in contrast to the bright sunshine we have experienced so far! We start our day at Rigby Road Depot and then make our way to the Pleasure Beach via the Central Promenade to see the trams assembling before being sent off with words from the Blackpool Town crier. A good representation of trams are in the cavalcade including a special appearance of OMO tram 8 in crimson and yellow livery. The parade is filmed as they set off to Little Bispham, and we also capture the trams as they return back, some going into service, others back to the depot. Our final tram ride is on board Boat 600, which only re-entered service on the previous Saturday after a complete refurbishment. This will be the final celebration with the ‘old’ tram fleet as only a few of the original trams will remain when the new trams enter service. So sit back and celebrate with us and enjoy the most famous tram fleet in the United Kingdom – if not the World!